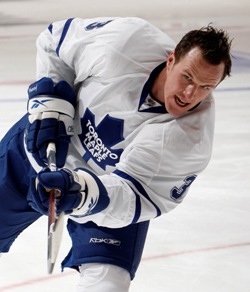 Dion Phaneuf was acquired by the Maple Leafs on January 31, 2010. He had 10 pts, 34 PIM in 26 games with Toronto. History will mark Monday, June 14, 2010 as the exact day that the Toronto Maple Leafs began a direct path toward a Stanley Cup championship. Time will, of course, record this day as the one on which defenceman Dion Phaneuf became the 17th captain in the history of the NHL’s second-most storied franchise. And with that move alone, GM Brian Burke and head coach Ron Wilson have started down a path that will, without doubt, end in a championship. The reason is quite simple, and two fold. First, in today’s NHL, with the right moves, you can build a winner almost instantly (right Chicago and Philadelphia?) Second, the biggest problem in Toronto, over the last, say, 15 years, has been what Burke calls “Blue and White disease.” It’s the Toronto-centric affliction that occurs when very average NHLers put on a Leafs’ jersey – and become, in their own minds and those of the perennially suckered-in Leafs’ fans, superstars. No effort is ever required, or even requested. No sweating either. Certainly no work ethic or actual “win or die trying” mentality. The worst case I ever saw of Blue and White was Darcy Tucker. Tie Domi would run a close second. Mats Sundin was my favourite. He talked and talked and talked, pretending he didn’t have it. But it coursed through every vein in his body. And there is only one cure for the dreaded Blue and White. Shuffle that player’s sorry a** right out of Toronto. And that’s what Burke has been doing. And that’s also why Phaneuf, who was born in Edmonton, is the perfect choice to wear the “C”. He doesn’t have Blue and White yet, and he still maintains the work ethic and leadership qualities required to lead these new young Leafs. Dion Phaneuf is just 25 years old. That’s a single. He has been a leader since his days with the Red Deer Rebels of the WHL. He’s a former NHL First-Team All-Star with Calgary (2008). Now we’re rounding second base. Phaneuf was notselected to play for Canada at the Olympic Winter Games in Vancouver. He’s gotta be p**sed about that and wants to show the world that he can still be the elite defenceman everyone thought he was. Standing on third now. And he doesn’t take anyone’s crap, on or off the ice. HOME RUN, baby! And when Dion Phaneuf captains the Maple Leafs onto the ice in October, he’ll mean business every game. And that’s exactly what this getting-younger-every-day group desperately needs. In Mats Sundin, the other players saw a floater. And guy who appeared to stand tall yet, when it came to actually leading men, delivered smoke and mirrors. Pat Quinn said Sundin was a good captain, so everyone simply started to believe it. Ah yes, the dreaded Blue and White. Over the past year, Burke has shown Jason Blake, Lee Watch-me-coast-my-way-around-Air-Canada-Centre, then-light-it-up-in-Phoenix Stempniak, Niklas Hagman, Alexei Ponikarovsky, Matt Stajan, Jamal Mayers and Jiri Tlusty and Vesa Toskala the door. They all had Blue and White. The Phaneuf appointment absolutely proves that Burke and Wilson mean business. They know exactly what steps they want to take and when they want to take them. Which is a lot more than can be said for the past half-dozen Maple Leafs’ general managers. And the Phaneuf captaincy is the first big one. Watch what moves the Leafs make following the Phaneuf appointment. Watch the shape they continue to take. And remember Monday, June 14th as the day it all changed in Toronto. Good points all ’round, but I’m going to play the “I’m from Missouri” card and wait for the buds to “show me”. We’ve been down this road before. It’s way easier to build a hard working, crowd pleasing, over achieving squad than to actually build a winner. And don’t get me wrong, I’ll take the over achievers, but Burke is going to have to find some skill up front. The AHL is filled with guys who will give their all, problem is they have no talent. Oh, and the best part is their shirts won’t look like practice jerseys anymore. They already are showing you, Shifty. They played the let’s-finally-appoint-a-young-stud-as-captain card. And, don’t forget, if this year’s Philadelphia Flyers weren’t a hard-working, crowd-pleasing, over-achieving squad, then I’ve never seen one. And I bet, at this point, about a truckload of Leafs’ fans would take a trip to the Stanley Cup Final – just like Philly fans did. Yes, hard work in a good system will win you games…but…Carter, Richards, Briere, Gagne, Giroux, Hartnell. The guys the Leafs have need to prove they can be those guys…show me, I’ll wait. OK if I didn’t know the definition for unbridled optimism before, I do now. Thing is, (to stay with the baseball analogies to explain hockey stuff), you could put Derek Jeter on a team of little leaguers and it will be a better team, even a team with real leadership, but I’m not sure they’d win a lot of games against a team with a roster of good players AND leadership. And don’t forget, you’ve still got Ron Wilson coaching this group. Good luck with that. So Ron Wilson became an idiot on the flight from Anaheim? Must have been some wicked turbulance. I’m still not sure about Mr. Wilson’s cred. He’s taken one team to the Finals (1998 Washington) with a ridiculously hot goaltender (Olaf Kolzig). And that’s it. In San Jose, he took a group of perrennial underachievers and underachieved. Problem is, I don’t know anymore who might be the right fit behind the Leafs’ bench. the day after the hawks won the cup EVERY media outlet (at least in canada) was saying the hawks winning the cup, gives leaf fans hope. also this year was being built as the leafs year to take stanley home. sorry big mouth im with shiftty on this one. lets wait and see. will the leafs remain faithful, or will they actually WIN sir stanley to the T-dot this year. only time will tell!